Naples Futsal is a company dedicated on promoting physical activity through Futsal. We started in 2009 with 6 Adult teams and now we have over 40 teams registered from U9 to Adult Division. Naples Futsal is the only futsal league affiliated with the U.S. Soccer Federation (USSF) through USAF, USYF and responsible for managing the sport of futsal in the United States. Naples Futsal is led by former player Luis Orellana Futsal native of Santa Cruz, Bolivia. Orellana played futsal starting 9 years old at the school Rio Nuevo, then in 1994 University signed him to play BSU in category B of the Soccer Association Cruceña ACFS when he was 16 years old. For his love of sport Orellana came to form his own club “Club Cristo Viene” in 1996 starting in the junior category and also other divisions for their younger siblings in the sub 14. For the year 1998 he put together the team to play more in association with the dream of playing Futsal First Division of Santa Cruz. Orellana in 2003 when almost 10 years retired from being an active player in indoor soccer after playing the 2003 season in the First Division to migrate to America with the idea of forming a school of soccer or futsal in the American territory. It was not until 2005 when it came to entering a school football coach “Doral Soccer Academy” in the city of Miami. Working for two years and then moved to Naples, Florida in search of his dream academy and an indoor soccer league to promote the sport of futsal that was not known at the time by this area. In October 2007 Orellana founded Eagle Soccer Club Academy in Golden Gate Community Park since 2008. It was not until October 2009 that Naples Futsal League was created with the support of County Parks and Recreation and Vicky Wilson who support this project from the beginning. Provide a healthy place where players and family members can attend and get distracted with Futsal. To promote physical activity as part of the intellectual and physical development of children and adults through Futsal. 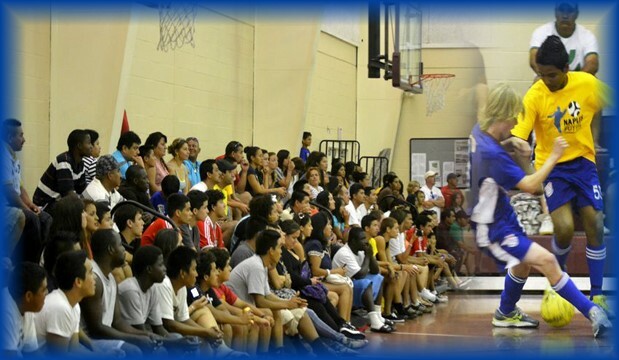 Florida Futsal project is not yet completed as we have many short-and long-term ideas with the help of God, county parks and recreation and also the unconditional support of the community to make sport of FUTSAL spread not only in the Naples city, but in the entire state of Florida. You are welcome to support this great project and help not only to develop a talented and skillful players but the more important goal develop better people for our community and the nation.